ERM Advanced Telematics design, develop and manufacture innovative vehicle security and GPS/GSM tracking and telematics solutions. ERM develop solutions for Fleet Management, Telematics and Stolen Vehicle Recovery service providers, to offer attractive services that create competitive advantages and help grow their business. ERM's products offer high quality, modular and wide variety of solutions, enabling greater protection and better management over vehicle fleets and valuable assets, while lowering operational cost for both the service provider and the end customer. 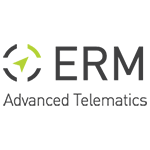 With more than 1.5 million active telematics devices installed in more than 65 countries, ERM is well positioned as a global leader in the industry. The chart below shows the changes within the last 30 days in the number units of ERM Advanced Telematics devices type are connected to Wialon Data Center.